We are nearing the peak of the Indian birding season, and hope that all of you are out and about, watching birds, noting down what you see, and documenting them when possible with photos, sound recordings and video. Upload at least 15 birdlists in the month, the more the better (see point #5). Eligible lists will be effort-based, complete lists, of at least 15 min in duration . Take photos, film videos and/or make sound recordings of birds to add to as many lists as possible. Remember that a photo, etc, should be taken at the time and location of that particular birdlist. When declaring the results of the challenge, we will display a wordcloud of the names of all birders who have uploaded at least 15 eligible lists (as you can see in the results of an earlier challenge). The more lists you have uploaded, the more prominent your name! We will then put all the lists uploaded by birders who have met the cutoff (15 lists) into one basket, and draw one list at random to choose the recipient of our monthly small gift. However, to be eligible for the gift, the list must contain media in the form of a photo, video or sound recording. So, if the first list chosen does not contain media, we will choose another list at random and so on until we find a winning list. To sum up, the more eligible lists you upload, and the more of them that contain rich media, the better! Please note that media embedded in the trip comments don’t count for this challenge — so a group photo of birders would not count. The media should be related to a specific species, and uploaded accordingly. Also, the media (photo, etc) should be of sufficient quality that the species should be identifiable. How to upload media like photos to your list? Well, as of last month, this has become as simple as drag-and-drop, with rich media upload having been rolled out across eBird. See the announcement and more details here. While we encourage you to use this new feature, we realize that some of you may prefer to stick to old system of embedding; and for video there is no direct upload available yet. So for this challenge, it’s fine to embed from third-party sites as before if you so wish. Don’t have a nice camera or fancy audio recording equipment? That shouldn’t stop you. Even a point-and-shoot camera can take good record shots. And did you know that it’s possible to take photos with your phone’s camera pointing through your binoculars or spotting scope? Why not give it a try?! For sound recording, your phone’s audio recording facility, while not perfect, can often do a very good job! Please upload all your lists by 5 January so that we can announce the results on 6 January. Orange-breasted Pigeon at Nagpur. 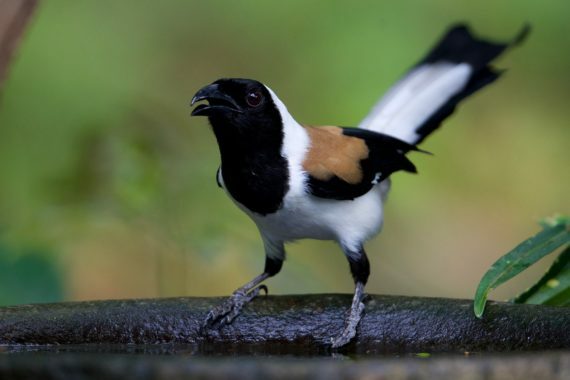 Photo uploaded as part of this eBird list by Rohan Chakravarty. That’s a knife in cheese to me… Lovely contest..